Matilde Waterfall, tucked away in greenery, is a famous tourist attraction in Brazil. The waterfall is a popular weekend getaway and is paradise for rappelling experts. Many people come here for rappelling as these spectacular landscapes are perfect for those who love adventure. A small winding trail will lead you to this beautiful fall surrounded by huge trees. Though the pool formed by this fall is not suitable for swimming, you will feel refreshed even after seeing the cascading clear blue water. You can sit in the shade of trees and admire the view. Coming here with your loved ones and spending some quality time with them will not disappoint you. Want to plan a DIY trip? 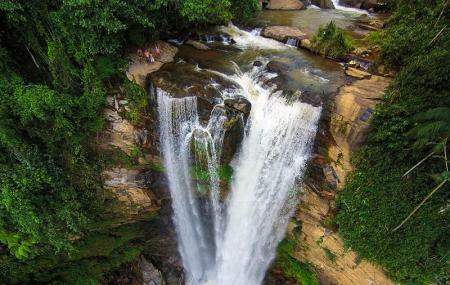 Use Alfredo Chaves trip planner for the same. Hotels like Pousada Do Zeze, Fora Do Ar and Pousada Brasil De Papel will solve your problem of where to stay in Alfredo Chaves. Chalk out the best way to discover the city with Alfredo Chaves vacation packages. Check out various modes for how to reach Alfredo Chaves. Love this? Explore the entire list of places to visit in Alfredo Chaves before you plan your trip. Fancy a good night's sleep after a tiring day? Check out where to stay in Alfredo Chaves and book an accommodation of your choice.